PATboard is the new era of effective project management – explore the ultimate physical scrumboard. You are interested in project management that is as effective as possible? Then, scrum is the solution for you – with PATboard. Scrum is a very modern type of project management that is very flexible and highly responsive to rapidly changing requirements. Forget plans of approach or any other old-school type of project management! Although scrum is mainly used in the IT business, it can be applied to just any project and will enhance your project management effectiveness. The main object of the scrum method is the scrumboard. 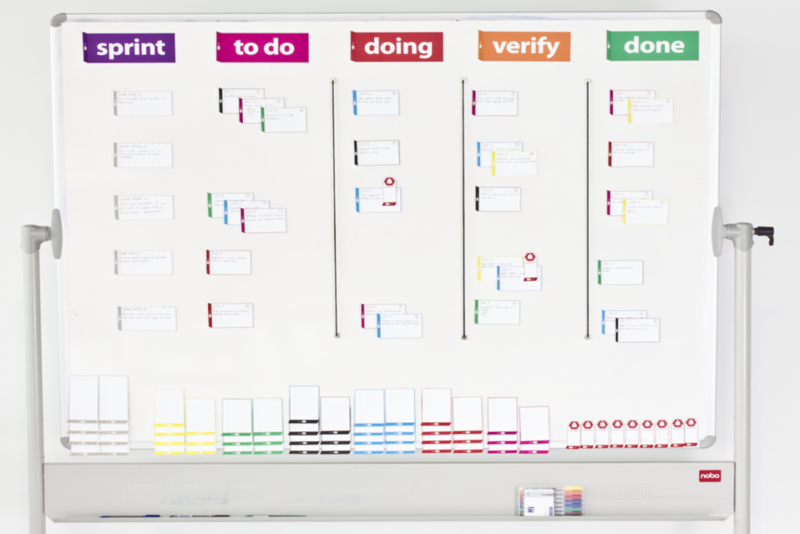 It is a taskboard used to manage activities, goals and progress – the communication radiator in the project management team. You can surely imagine the effectiveness of a motivated team sitting together in one room and working together with this creative type of project management – brainstorming, bringing ideas together, putting them on a physical board and shifting them around as the project moves on! With the emerging use of the internet, a lot has moved online. Online scrumboards appear to be handier as people can work together from different locations. But: All experts agree that a board you can touch and interact with boosts effective communication, involvement and commitment. A physical taskboard will help your team move forward. Because exchanging ideas, collaborating (and hugging) works best when you are in the same space. Just imagine: You are much more involved and feel as part of the team if you are together in one room, you have something tangible in your hands, and put it all together as a team. And, when an activity or task is completed, it just feels different to move a physical card to “Done” than clicking on a button. Scrum is not a new method – it has been used by many well-known companies for project management. However, the classic appearance of scrumboards takes the form of a literal post-it chaos. PATboard resolves this chaos. It is the ultimate physical scrumboard – developed to make project management just as effective as possible. PATboard provides you with a set that is complete and ready for any scrum team. Everybody hates dog-eared notes dropping from the taskboard. 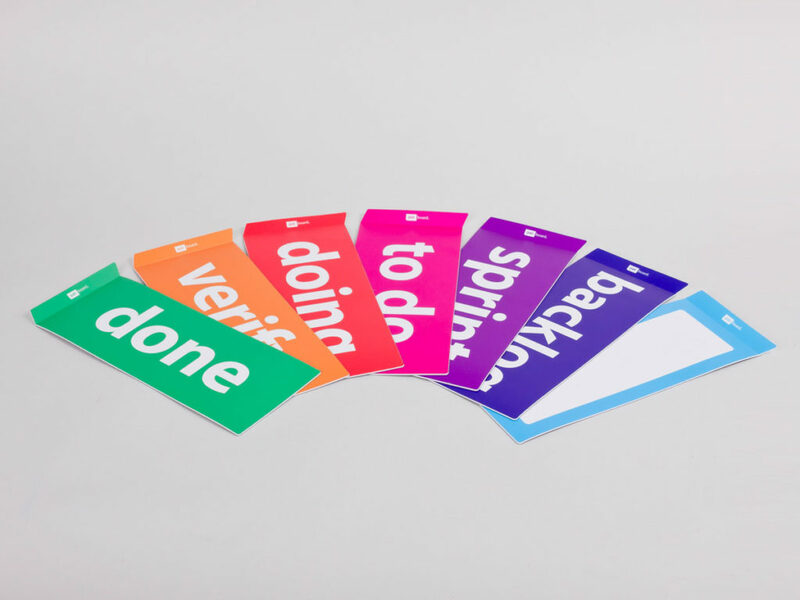 Therefore, PATboard designed the perfect solution for scrum teams: super handy, movable, washable, magnetic cards. Surrounded by an accomplishing set consisting of everything you need for scrum, PATboard makes your team ready for the future of project management. The basic PATboard scrum set provides you with the ultimate scrum tool. It contains everything you need to start with effective project management – and it is extendable at any time. It’s magnetic, stackable, reusable and above all: it looks fantastic! True Dutch design. The cards are easy to write on. It doesn’t smudge and is easy to clean with water. It can be used on all magnetic (white) boards. It does the same as sticky notes, but way better! No falling down, no curling, reusable and it looks excellent. Explore Scrum now with PATboard – the ultimate physical scrumboard.